Now you can complete or change your company information. 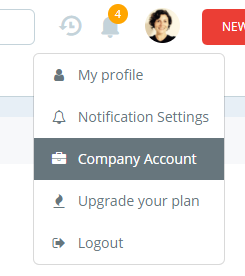 First, click on your avatar at the top right of the screen, and then click “Company Account”. You will see your company’s information. Click on “Edit account” to change the name, phone, address, city and country. To make your page more interesting, you can add your company logo clicking on “Choose file”. Then, choose “Logo” in “Show in page header”. Click “Save”. In the next page, you will find the account statistics: how many users, how many jobs were created and closed and how many files have been uploaded. The “To free space” button is of great help when the account is next to its storage limit. Clicking on it, you select the files from old tasks (3, 6, 9 or 12 months ago) to be deleted. There is a table on the right side showing the assets of your plan. If you want to change your plan, click on “Change plan” button, then “Migrate”. The change will be made after payment. You can also use a shortcut to change your plan. Just select “Upgrade your plan” clicking on your name at the top right of the screen. Back to the company’s page, you can close it. Just click the red button "How to close my account".